Note 05/11/2015: the original numbers published here were based on some faulty data – I found attacking moves that persisted even when the opposition won the ball back. This had the effect of making most moves seem longer and wider. Fortunately, after fixing that, Man Utd stay at the top and Leicester at the bottom, the changes at Newcastle and West Ham still seem real, and the correlation from year-to-year is now even stronger. Many thanks to the commenters on this post whose Tottenham spidey-sense caused me to take a second look. The incredibly ponderous Man Utd sit at the top of the table, giving themselves on average 28 seconds with the ball in the buildup to their shots. At the bottom are Leicester City – could they be the most direct team in the Premier League? Looking at their width number, they also seem to use less space on average in their attacks than any other team. Part of the reason is that the space you have to cover and the time it takes to cover it are of course tightly linked, but look at West Ham – short-lived attacks but making use of much more width. What’s more interesting about these numbers it that they seem to hold over from season to season. Part of that is obviously the quality of players at a club – Leicester’s success aside, you would probably bet on the wider, slower teams in the top half of the table to secure European places over the bottom half. Better players can keep the ball longer, and can move the ball about the park more easily, so we’d expect the best teams to have higher width and duration numbers. That said, I did a quick check and the average buildup time for goals is the same as all shots, around 18-19 seconds – there’s no indication that quicker or slower is necessarily more effective in creating goals. Almost all teams post similar numbers (duration has an R2 of about 0.8), and again you could easily explain that as player quality, but for the radical changes at Newcastle, who sacked John Carver and replaced him with Steve McClaren over the Summer. They’re now taking a whole extra 6 seconds in the buildup to their shots, and using 9% more of the field to do it in. West Ham brought in Slaven Bilic and have added 2.5 seconds and 5 percent more space. There are more outliers that spoil the story a bit – Man Utd were very wide in 2014, less so now, and both they and Swansea are building up a lot slower this year), but I think these duration and width numbers – how fast, how directly you attack – are a very clear part of a manager’s signature. This week in gratuitous visualisations with little or no analytic value, I thought I’d show where each team’s passing gains are coming from this season. 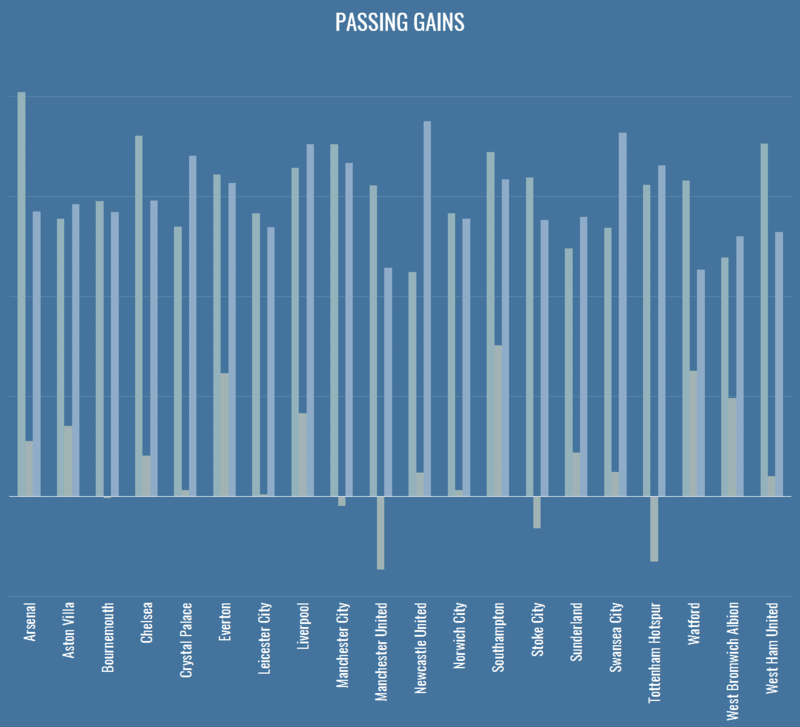 Below you can see, for each EPL team, the proportion of gains coming from passes into the left, centre, or right thirds of the pitch – so just to be clear, a long ball from the right hand side to the left is notched up as a gain on the left. Ignore units for now, it’s the relative sizes that I think are interesting. Man Utd and Spurs in the aggregate make backward passes to the middle of the field. These are the teams most obviously utilising a pivot, as they recycle possession from wing to wing probing for an opening. Arsenal’s Sanchez-powered left wing has made more gains than any other attack in the Premier League. Everton and Southampton are two teams making big gains in the centre of the field. I’d be interested to see in either team’s case how this possession progresses, because in Everton’s case they often run into dead ends centrally. There’s hope for Newcastle down that right hand side, with Moussa Sissoko’s club-leading 4 assists. West Brom don’t seem particularly penetrative, as Tony Pulis concentrates on reaching the heat-death of the universe with as many clean sheets as possible.